Charles Caliri was charged with possession with intent to distribute in connection with federal drug raids in Lewiston and Auburn targeting a medical marijuana growing operation. A Vermont man pleaded not guilty Tuesday to a marijuana trafficking charge stemming from federal drug raids in Auburn and Lewiston in February that resulted in more than a dozen arrests. Charles Caliri, 70, of Woodstock, Vermont, was charged this month with possession with intent to distribute marijuana, a felony punishable by up to five years in prison and a fine of up to $250,000. 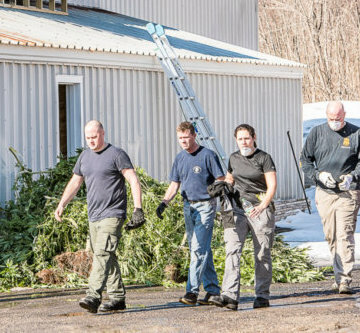 The Feb. 27 raids at 20 locations in the Twin Cities area targeted a medical marijuana growing operation that illegally sold surplus pot and derivatives, according to police and federal drug agents. Caliri entered his plea when he responded to a summons Tuesday morning to U.S. District Court with his attorney, Peter Rodway, who told the judge he planned to file a suppression motion before the end of November. U.S. Magistrate Judge John Rich III freed Caliri on an unsecured $10,000 bond and issued an order outlining the conditions for his release, including surrender of his passport in one week, no contact with any co-defendants (except with legal counsel) or any government witnesses. He is allowed to travel to Maine, Massachusetts, New Hampshire and Vermont and elsewhere as allowed by his probation officer. Rich told Caliri, who uses medical marijuana, that he is prohibited from having or using pot while he is on bail. Maine, Massachusetts and Vermont have legalized the recreational use of the drug. Caliri was among the 14 people and nine companies indicted Oct. 5 by a federal grand jury. Prosecutors allege that a drug-trafficking organization operating out of the Twin Cities used the cover of Maine’s medical marijuana program to grow and distribute large amounts of marijuana that was illegally sold to buyers who were not participants in the program, including out-of-state customers. The businesses named in the indictment are alleged to have laundered the illicit drug proceeds. Seven more people named in the indictment are scheduled to be arraigned in U.S. District Court on Thursday, along with four related businesses.